1. What is Risk Taking Behavior? 2. How Do We Perceive Risks? 3. Who Engages in Risk Taking Behavior? 4. Which Situational Factors Influence Risk Taking Behavior? 5. How is Risk Taking Motivated and Emotionally Experienced? 6. What Controls Risk Taking Behavior? 7. What are the Consequences of Risk Taking Behavior? 8. How Do We Adapt to the Desire for and the Control of Risk Taking Behavior? 9. How Can We Explain Risk Taking Behavior Holistically? 10. What Does Risk Motivation Mean for Our Daily Lives as Researchers and as Normal Risk Takers? Research implications of a motivation for risks. Implications of a risk motivation for real life. Personal conclusions. References. Author index. Subject index. 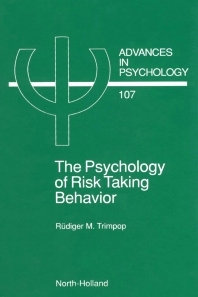 This book aims to help the reader to understand what motivates people to engage in risk taking behavior, such as participating in traffic, sports, financial investments, or courtship. The consequences of risk taking may be positive, or result in accidents and injuries, especially in traffic. The wealth of studies and theories (about 1000 references) is used to offer a cohesive, holistic view of risk motivation. The risk motivation theory is a dynamic state-trait model incorporating physiological, emotional and cognitive components of risk perception, processing and planning. If a deficit exists between desired and perceived risk, risk compensation behavior results. A feedback loop provides new information for the next perception-motivation-behavior process. Assumptions were tested and support was found with 120 subjects in a longitudinal study. The concepts and findings are discussed in relation to psychological theories and their meaning for our daily lives.